INDIANAPOLIS — As a non-governmental (NGO) organization with the United Nations (UN), Sigma Theta Tau International Honor Society of Nursing (Sigma) is pleased to share we are expanding our representation at the UN. Until now, Sigma has relied on two UN volunteer youth representatives and one UN volunteer liaison to represent Sigma at UN events, programs, and activities related to health and/or nursing. Now, Sigma’s number of UN liaisons is expanding from one to four, allowing Sigma to have more physical representation at these important meetings. Sigma will continue to have two UN youth representatives in addition to the four liaisons. Sigma’s volunteer UN liaisons advocate on behalf of Sigma at the UN and among the NGO community, with the purpose of gathering information to inform and advise the global initiatives department at Sigma headquarters to help us fulfill our organization’s mission. Applications for the UN liaison positions are due 3 August 2018. Complete the online application. In July 2012, the United Nations Economic and Social Council (ECOSOC) granted special consultative status to Sigma, based on expertise in the field of nursing and global health. This UN designation recognizes Sigma’s commitment to the charter of the UN, which seeks to achieve international cooperation toward solving humanitarian issues. This was predicated on the approval as an associated non-governmental organization (NGO) by the Department of Public Information of the UN in December 2009. Special consultative status allows Sigma greater privileges and access to nearly all intergovernmental processes at the UN dealing with economic and social development, including health and gender issues, sustainable development and human rights. It also allows Sigma to participate on UN committees through which Sigma has a “voice” at the UN. As part of this affiliation, Sigma commits to disseminate information and raise public awareness about the purposes and activities of the UN and related issues of global concern. Sigma continues to provide a strong nursing presence at the UN and conducts outreach around the world to help our nurse members better understand the work and aims of the UN, including the Sustainable Development Goals (SDGs). To learn more about Sigma’s involvement in the United Nations, visit www.SigmaNursing.org/Global. Sigma Theta Tau International Honor Society of Nursing (Sigma) is a nonprofit organization whose mission is advancing world health and celebrating nursing excellence in scholarship, leadership, and service. 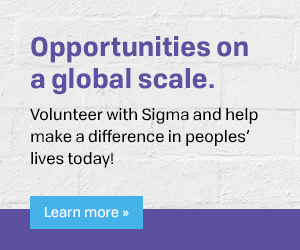 Founded in 1922, Sigma has more than 135,000 active members in over 90 countries and territories. Members include practicing nurses, instructors, researchers, policymakers, entrepreneurs, and others. Sigma’s more than 530 chapters are located at more than 700 institutions of higher education throughout Armenia, Australia, Botswana, Brazil, Canada, Colombia, England, Ghana, Hong Kong, Japan, Jordan, Kenya, Lebanon, Malawi, Mexico, the Netherlands, Pakistan, Philippines, Portugal, Singapore, South Africa, South Korea, Swaziland, Sweden, Taiwan, Tanzania, Thailand, the United States, and Wales. Learn more at www.SigmaNursing.org.